Watercress leaf is a rich in nutrients that have been used as a tonic since ancient times to cleanse the blood and liver of toxins and promote an overall feeling of good health. The herb has been used for enhancing stamina, ridding the body of excess fluids, and it is also thought to be a great antioxidant, particularly in cases of malignancies associated with the lungs. Watercress appears to be a chemo-preventive agent against lung cancer induced by the tobacco-specific lung carcinogen. Watercress is considered to be an effective diuretic that promotes urine flow, which helps in clearing toxins from the system. It is also said to help relieve excess water retention and edema. Some have claimed that it may help heart disease by relieving retained fluid. The herb is also thought to support good kidney function and ease urinary and bladder problems. 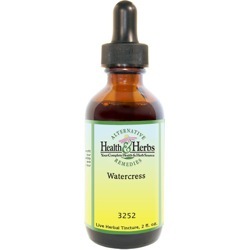 Many cultures have used Watercress to break up kidney or bladder stones. Natural herbalists have used Watercress as a blood purifier with system cleansing properties that help to clear toxins from the body. Because it is high in potassium, it is strongly alkaline and considered to be useful in treating acidity and purifying the blood. It has been useful in treating skin eruptions, eczema, acne, rashes and other skin infections. Considered a tonic for the liver, this herb has been used to promote bile production and flow, which not only supports liver function and ease gallbladder complaints, but it is also very beneficial for the digestive system. The herb has been thought to alleviate indigestion and inhibit gas formation. Watercress was used to treat scurvy in the past and though it is not very common these days, the herb is good for helping other imbalances relative to vitamin C deficiency. It is also a rich source of iodine. An effective expectorant, Watercress helps to expel excess mucus and is believed to relieve bronchitis, catarrh of the upper respiratory system, coughs and mucus in the lungs. High in iron content, it is considered to be useful in cases of anemia. Loaded with nutrients it has been considered an overall tonic for good health. It has been used to ease the debility associated with chronic disease, as it helps to increase physical endurance to the convalescent and the debilitated individuals. It is used to enhance the body's immune system and to stimulate the body's rate of metabolism. Watercress was used in the past to help in cases of tuberculosis, and recent studies have found that it may be effective against cultures of the tubercle bacillus. Recent research shows promise in studying Watercress's use as an antioxidant that may have potential in treatment for malignant diseases. Watercress may be particularly beneficial for the eyes and the heart. Rich in carotenoids, lutein, and zeaxanthin, and it has been linked to a lower risk of advanced age-related macular (eye) degeneration, the most common cause of adult blindness. With regard to heart health, there is growing evidence that suggests that lutein and zeaxanthin may also offer important protection for the cardiovascular system. Individuals with higher levels of lutein and zeaxanthin were found to have less atherosclerosis of the arteries of the neck than those with lower blood levels. In these studies, people with higher blood levels of lutein were less likely to succumb to a heart attack than those with lower levels. It is also useful for lowering blood sugar levels. Other uses have been found for the treatment of gout, freckles. pimples, skin spots, and as a poultice for arthritis when mixed with sea salt. Ingredients: Watercress Leaf, Structured Water, 20% Alcohol. Non-Alcohol: Watercress Leaf, Structured Water, Vegetable Glycerin. Contraindications: Overuse (many times the recommended dosage) or prolonged use of Watercress on a daily basis (more than four weeks) may cause stomach upset or kidney problems. Some doctors caution against use during pregnancy, as it may be a uterine stimulant. Individuals with allergies to members of the cruciferous vegetables (cabbage, broccoli, cauliflower, Brussels sprouts, kale, mustard greens, collard greens, bok choy, and turnips) should avoid Watercress. Do not use Watercress if you have duodenal ulcers or kidney disease, and it should not be used by children under the age of four. Although not well studied, some early research claims that Watercress may interfere with the way certain herbs, medications or other supplements may work in the system (either increasing or diminishing efficacy), so it may be wise to take Watercress separately.